Need a quick breakfast that will travel with you in the car? With just a travel mug, you can have breakfast ready in under 5 minutes and be out the door! 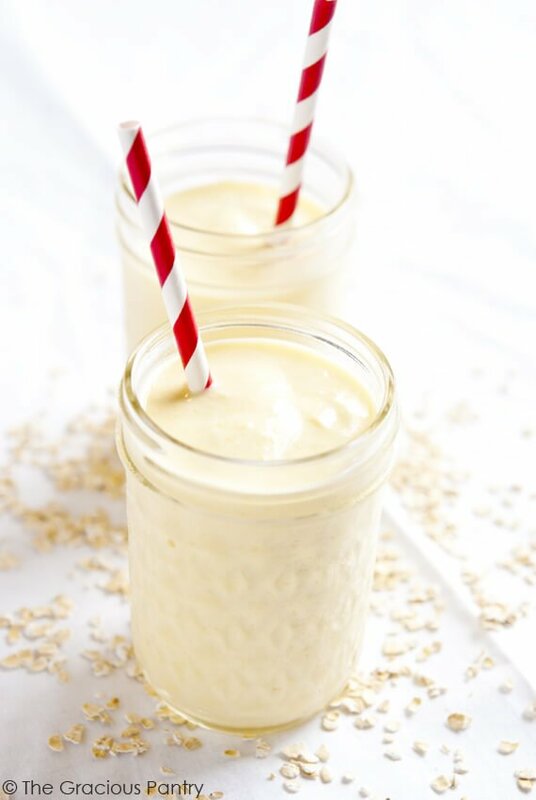 This refreshing smoothie will also keep you full longer due to the protein from the cottage cheese and the raw oats. This make a great after-workout smoothie as well. Plenty of protein, fiber and flavor. It hits the spot every time! Note that there may still be a bit of texture due to the raw oats. But it’s the oats that will keep you full until lunchtime. When you speak of “clean” cottage cheese, do you have a brand in mind? What are you looking for in one exactly? thank you. Coye – I haven’t actually found one yet, so it’s hard for me to say. But some readers have told me that they did find some in their areas. I just don’t know the brands. Next time it comes up I will ask. Coye Hoth, I eat Daisy Cottage Cheese. Ingredients are cultured skim milk, cream & salt. The low fat has vitamin A palmitate. It’s the only one I’ve found that doesn’t have other stuff in it. Tonya – Thanks so much! You can use rolled oats. Just blend them by themselves first, then add the rest of the ingredients and blend again. Tina – Good to know! What could I replace the cottage cheese with? Kayla – Plain yogurt. But you may have to up the honey a bit.